BBJ Micro Coil Clean is specifically designed for use in mini splits, ductless systems, window units, package units and other compact HVAC and refrigeration systems. It is a self rinsing coil cleaner that effectively removes accumulated residue, restores operating efficiency, and prepares the unit for sanitization. This formula is safe for all metals, including aluminum and copper. 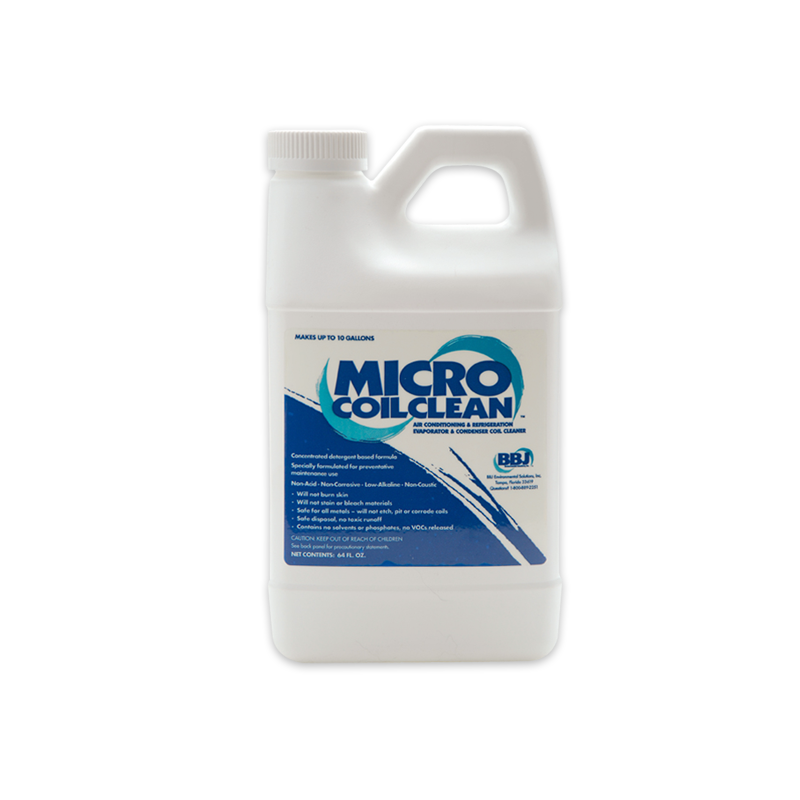 BBJ Micro Coil Clean is a pH balanced coil cleaner that harnesses the power of three highly effective surfactants. BBJ Micro Coil can be rinsed away with water or used as a self-rinsing coil cleaner. Safe for all metals, including aluminum Will not etch metal. Some acid coil cleaners can etch the metal surfaces causing water blow off on the evaporator coil which in turn can cause microbial contamination downstream. User friendly, safe to use Will not harm plants or shrubs. You can wash your hands in it. Non-acid, low alkaline, biodegradable May be used on both indoor evaporator coils and outdoor condenser coils. Authorized for use by USDA May be used in federally inspected meat and poultry establishments. Detergent-based formula, specially formulated for preventative maintenance. Q: Why is BBJ Micro Coil Clean so effective? BBJ Micro Coil Clean, with its highly effective detergent-based formula and specially engineered surfactants, removes the most stubborn soils and deposits on cooling coils. This buildup interferes with proper system operations and supports the growth of harmful bacteria and fungi. BBJ Micro Coil Clean removes accumulated buildup and restores operating efficiency. Q: Is BBJ Micro Coil Clean corrosive or caustic? BBJ Micro Coil Clean is neither acid or alkaline. Its special detergent-based formula contains no harsh acids or caustic chemicals. It also contains no solvents or phosphates, and releases no VOCs. It is very user friendly. Q: Is BBJ Micro Coil Clean self rinsing? BBJ Micro Coil Clean IS self rinsing, however, we recommend a rinse once the product has had a chance to clean, generally 5 minutes or less. The rinse can be in the form of a pump sprayer or specialized coil washer like the CoilJet from SpeedClean.